I’ve just spent a large part of my day trawling through Garth Johnson’s farcical and fiery Pottery Liberation Front (PLF) website. 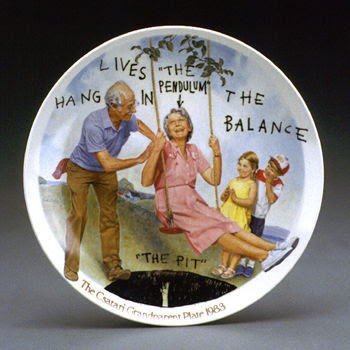 If you’re involved in the world of ceramics it will probably give you a good giggle. Although, it could just as easily annoy or offend you! Whether you agree with him or not, its still worth a read! His approach is quite amusing, if not over-the-top! I particularly enjoyed trawling through the project section… take your time here, its worth it! (thanks for the link Laura, and for aiding and abetting a rainy day of procrastination). Hey Mel, Thanks for the link! It's good that people bother to keep stirring the pot.It shakes you out of your complacency.I got my copy of 'Breaking the Mould' via Coaldrakes ,thanks again. Ceramics books have a strange affect /effect on me,they get me all excited at first ,then l feel ultimately a bit empty.